We are ecstatic to announce the launch of our new website for #BetterCities. The website has been a long time coming. Even as we make this announcement, we are well aware that our efforts to contribute to better urban living and better cities in Southeast Asia is still a colossal work in progress. Our vision and groundwork begun slightly more than a year ago, with a simple message that our cities should be people-centric, participation-rich and place-conscious. Our year-long campaign (and behind-the-scene development) is finally taking shape and it is times like these that remind us why we started #BetterCities in the first place: to continue to shape and make our cities, its people and places, as vibrant and meaningful as possible. Our manifesto marked the birth of our campaign. The document was drafted in response to all of our city’s shortcomings, in response to a proliferation of growing frustration, and in response to a cacophony of rants and not resolutions. It is a living document, from time to time, focuses may change, priorities may shift, but ultimately, it distills our fundamental philosophy of taking charge of the neighbourhood and city we live in. We do that first by embracing the complexities and challenges of our urban landscape, and then adopting smart and visionary ways of interacting with our city. We want to explore new possibilities. This is a selection of our projects since our inception. Our projects are typically collaborative. We also believe that urban projects should be able to be replicated elsewhere, given the right context, right place and right team. Our works and projects (unless listed otherwise) are licensed under Creative Commons. If you are interested to work or fund one of our projects, please contact us. Follow our blog for project updates and work-in-progress featurettes. We apologize if our content is not constantly up-to-date. For bite-sized updates, you may also follow updates from our Facebook, Twitter and Pinterest pages. We want to join forces and collaborate with other stakeholders in our respective neighbourhoods and cities. If you are interested in our campaign, be it as a sponsor, a collaborator, a volunteer or an audience member, find out how. …and we have big plans for 2013! Our big agenda this year is take on the issue of urban mobility and neighbourhood-level projects. On the issue of urban mobility, there are approximately 5 million registered vehicles in Kuala Lumpur, with an overall increase of 11.74% in the nation since 2009 (source: here). 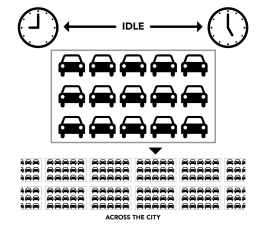 The increasing reliance on private vehicles is a considerable factor that has contributed to urban traffic congestion. In addition, there is still a low ridership on public transportation in the city centre, largely due to lack of a well-integrated public transit system. We want to encourage a city that is more bikeable and walkable. Let’s take charge of our neighbourhoods. We can start by taking more activities out of our homes, our gated communities, and shopping malls and to shared public spaces. Finally, please be patient as our lean team continues to populate the website with content in the coming days. This website, much like our cities, is a work-in-progress. 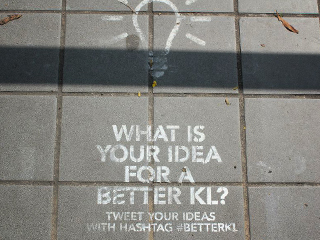 Send us a love note, if you have feedback or suggestions, to hello@betterciti.es. In 2011, #BetterKL and our sister site, Poskod.my, co-organised a free public talk series, Poskod Talks, highlighting ideas, insights and individuals contributing to a better Kuala Lumpur. The monthly talk series aimed to create an open and critical platform to discuss relevant issues of social, cultural and urban importance to Kuala Lumpur — its city and community. The talk series was hosted in different neighbourhoods (postcode areas) highlighting diverse themes on urban living, environment and engagement. Throughout 2012, Poskod Talks had showcased projects and individuals mapping the city, organising community projects, rejuvenating neighbourhoods, rethinking art and design for social good, et. al. Past speakers included Henrietta Thompson (editor-at-large Wallpaper*), writer/researcher Sali Sasaki (previously from UNESCO Creative Cities), urbanist Marco Kusumawijaya (RUJAK Centre for Urban Studies in Jakarta), architects Karsten Vollmer (Foster + Partners), Kevin Mark Low (smallprojects), Ng Seksan (Seksan Design), Nani Kahar (labDNA), Lillian Tay (Veritas). Since the launch of #BetterCities, we have re-branded Poskod Talks to #BetterCities Talk Series. From 2013 onwards, #BetterCities will be organising a new talk series every quarter, on the last Saturday of the month. For videos of the talk series, please visit our Youtube channel. ReCAR is a model for a new public utility company that owns and operates carports throughout the city, equipped with compact and environmentally- friendly cars. This concept was nominated for the Living Labs Global Award 2012 in Rio de Janeiro and exhibited at the British Council’s Everything Forever Now, an exhibition on sustainable designs in Malaysia. ReCar is an innovative break from the typical transportation model. The traditional model is a patchwork of best attempts at managing the various interests of city planners, individuals, and the transport authorities, often resulting in highly inefficient solutions. ReCar re-imagines the very idea of private mobility and proposes a solution that encourages the efficient use of public transportation while increasing urban mobility. A typical office worker drives into the city in the morning and leaves the city for home around sundown. Even in the most traditional work cycle that’s an 8 hour stretch of her car sitting idle waiting for the return trip. Chances are it’s a single occupancy vehicle. Multiply that by every office worker in the city and you have the single largest collection of idle metal concentrated in massive concrete structures called parking spaces. This creates massive dead spaces within cities. The ReCar is an alternative model that allows people to move freely within a city, save time on traffic and save money on parking. Commuters would use public transport like buses and trains to get to the city. They would then able to hire a ReCar at various points throughout the city for intra city commute, leaving their ReCars at the carport closest to their destination. These cars would run on natural gas. ReCar is a model that could lead benefits in the economy, environment and in the community. More importantly, it would encourage more interactivity in the city, and could allow public spaces to be reclaimed from vast, idle car parks. ReCAR was showcased at the British Council Malaysia’s EVERYTHING FOREVER NOW exhibition from August 25 – September 13, 2012. Much of an average commuter’s daily commute in Kuala Lumpur is spent idly waiting. In response to this scenario, While We Wait is a creative, interactive project devised to address and interact with commuters’ idle time while they wait for their bus to arrive. The project consists of a series of activities, installations and surveys to initiate curiosity and conversations about shared spaces and quality of time/life in a city. Bus stops are typically temporary, transitory congregation points with its monotonous design reduced to serve this said utility. 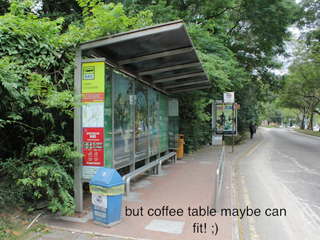 The process of “hacking” a bus stop space looks at the potentiality of shared public spaces, i.e. “What is missing?” and “What could be there?”. It is also an attempt to understand, engage and instigate the commuters and their social encounters within this shared space. While We Wait is supported by The Embassy of Finland Malaysia.